Fighting out of the acclaimed Team Elevation in Colorado, Cory Sandhagen looks like a bright prospect in the UFC’s stacked bantamweight division. A long and rangy fighter, Sandhagen’s striking is his most notable asset. Against Austin Arnett, Sandhagen’s footwork, head movement and use of angles were highly effective. His shot selection is extremely creative and I believe he’ll have a striking advantage over most of the division. Sandhagen’s grappling, especially his defensive wrestling, is still a bit of a question mark. Although he’s looked competent on the mat in the brief glimpses we’ve seen, he hasn’t been tested by an opponent that will look to take him down repeatedly. Mario Bautista is that kind of opponent. While not the most fundamentally sound striker, Bautista is scrappy and looks to punch his way into the clinch. I don’t think he’s a great wrestler, but he is tenacious and I wouldn’t be surprised if he scored an early takedown or two. On the mat, Bautista transitions well to back mount and likes the rear-naked choke – but can threaten with other submissions too. Stylistically, Bautista could cause Sandhagen some problems and I can’t hate on anyone taking a stab at +385. However, I think it’s far more likely that Sandhagen deals with the initial grappling onslaught and smashes Bautista on the feet. It’s worth noting Bautista has an energy-intensive style and is taking this fight on short notice. I decided to put Cory Sandhagen in a parlay at -400. After bouncing from camp to camp throughout her career, it sounds like Scottish striker, Joanne Calderwood, has finally found a home at Syndicate MMA under head trainer (and now boyfriend) John Wood. Perhaps finding peace in her personal life will lead to an improvement inside the octagon, but who am I to speculate? Calderwood is known as a blood and guts muay thai fighter. While not particularly fast or athletic, her offensive striking is solid – especially her kicks. Defensively she leaves herself wide open and doesn’t react well to being hit. That being said, she’s never been finished with strikes and will fight tooth and nail to earn a victory. In interviews, Calderwood mentioned training a lot with jiu-jitsu stylist, Roxanne Modafferi, and picking up some techniques from her. Despite being controlled on the mat by Kalindra Faria in her last bout, Calderwood was able to lock in a submission and get the tap in the dying seconds of round one. Calderwood has a tough match-up against surging Brazilian prospect, Ariane Lipski. Upon seeing Lipski’s Instagram page, I had suspicions she was signed for reasons that don’t pertain to fighting. However, I was proved wrong as soon as I watched some footage. This woman can seriously strike. Lipski has surprisingly good boxing for a muay thai striker – throwing combinations with blistering speed. She will have the speed, power and athleticism advantage over Calderwood. Defensively, Lipski is not wizard but I’m not sure if it will matter in this match-up. I’m also not clear on how good her ground game is, despite having a purple belt in jiu-jitsu. Looking at the footage of both fighters, Lipski should dominate standing – she’s just too fast and explosive. My concern is that she has so many early stoppages on her record – what’s going to happen if Calderwood survives the early onslaught? The Scottish fighter could potentially weather the early storm and then win on volume in rounds two and three. Still, at -200 I’m prepared to take the risk on Ariane Lipski as I deem her striking advantage to be significant. Catapulting himself into the spotlight with a first round annihilation of Beneil Dariush, Alexander Hernandez looks like a good prospect at lightweight. He’s fast, explosive and a strong wrestler. At only 26-years-of-age, he should still be making improvements from fight to fight. While Hernandez put on a dominant grappling performance against Canadian judoka, Olivier Aubin-Mercier – I’m not sure how many insights from that fight are relevant to this one. Although a bit long in the tooth with a tonne of mileage on his body, Donald Cerrone is an elite competitor. Extremely well-rounded, Cerrone has the ability to win by submission, knockout or decision on any given day. Coming from a muay thai background, Cerrone is definitely the more technical striker. His low kicks are legendary and I suspect he will fire his knee down the middle to deter Hernandez from closing the distance (as he did against Eddie Alvarez). While Cerrone can be taken down, you can’t relax in his guard. “Cowboy” is dangerous off his back, as well as when he’s in a dominant position on the mat. One criticism of Cerrone is that he’s a slow starter so it wouldn’t surprise me if Hernandez came out like a raging bull and mowed him down in the first few minutes. However, Hernandez is extremely explosive and I suspect Cerrone will have the cardio advantage in the second half of the fight. I see this as a 50/50 contest so I’m taking my chances with half a unit on Donald Cerrone at +162. 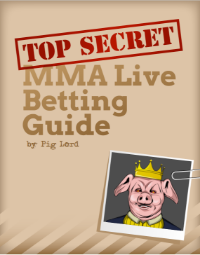 If he doesn’t get wiped out early and is looking good, I’ll add to Cerrone with a live bet. As one of the elite contenders in the light heavyweight division for a long time, I believe Glover Teixera is finally slowing down. Now 38-years-of-age and without the chance of another title shot anytime soon, I question how much is left in the tank for the Brazilian Veteran. This isn’t to say Teixeira is completely finished, he’s extremely well-rounded and I would pick him over most of the division – but it looks like the mileage is catching up to him. Against Misha Cirkunov, a fighter that he would have smashed in his prime, Teixeira’s reaction times looked noticeably lagged. Although he was able to get a body lock, muscle Cirkunov to the mat and finish him – the performance was hardly confidence inspiring. Cirkunov looked like the far superior striker and like Karl Roberson, is also a southpaw. I felt Teixeira looked lackluster in his last contest with Corey Anderson – who is one of Roberson’s main training partners. A smooth kickboxer with a precision left hand, Roberson looked great in his last bout. Showing off excellent distance control and slick counters, Roberson made a fool out of boxing stylist, Jack Marshman. His offensive wrestling also looked good in that fight, so it could be an indicator of what he’s working on in the practice room. What worries me about Roberson is that he’s a natural middleweight, is taking this fight on short notice and was recently dominated on the mat by jiu-jitsu black belt, Cezar Ferreira. Although he doesn’t come from a wrestling background, Teixeira always had good double and single leg takedowns and will have a big advantage from top position. If you’re betting Teixeira, I don’t blame you. Personally, I’m going with Karl Roberson at +100 as he’s still in his athletic prime and looks to be making steady improvements. I’m not going to dwell on this for too long. Allen Crowder has been handpicked by the UFC to get murdered by former NFL star, Greg Hardy. Crowder isn’t a bad fighter – his wrestling and boxing are serviceable, but he’s not exactly great either. Worryingly, Crowder is small for the heavyweight division, leaves his chin exposed and is not particularly athletic. Those are not good deficiencies to have when facing an animalistic football player with extreme power. I’m sure Crowder isn’t planning to bang it out with such an explosive opponent. I’d expect his game plan will be to control Hardy against the fence, perhaps take him down and increase the pressure once Hardy (hopefully) starts to gas. I just don’t think he’s going to be able to execute successfully. To be a star in the NFL, it’s a given that you’re an athletic specimen. For a full sized heavyweight, Hardy is extremely fast and can generate huge power in short spaces. While he’s still somewhat hittable, his offensive striking already looks very solid for the amount of time he’s been training. From the limited footage I’ve seen, I think Hardy is also capable of defending against a wrestling attack. We may see Hardy dragged into deep waters at some stage, but I don’t think it will be this weekend. I just hope Crowder doesn’t literally die when he gets knocked out. My only play for this fight is under 1.5 rounds at -275. After dethroning Demetrious Johnson (the long reigning champion of the flyweight division), Henry Cejudo looks to cement his legacy as one of the best fighters in the world at the lighter weight classes. Facing him will be current bantamweight champion, TJ Dillashaw, who will be dropping to flyweight in a quest to become a double champion. While I cashed huge on Cejudo’s upset over Johnson, you can definitely make an argument the decision should have gone the other way. Cejudo was outstruck on the feet but stole rounds with well-timed takedowns. He may try and squeak by with another sports decision here, but this game plan will be harder to execute against a bigger wrestler in TJ Dillashaw. Cejudo’s striking has improved a lot in the last few years – but I believe he’s at a disadvantage standing. While he has good hands, his wide stance makes him susceptible to leg kicks and Dillashaw will be the taller, rangier fighter. 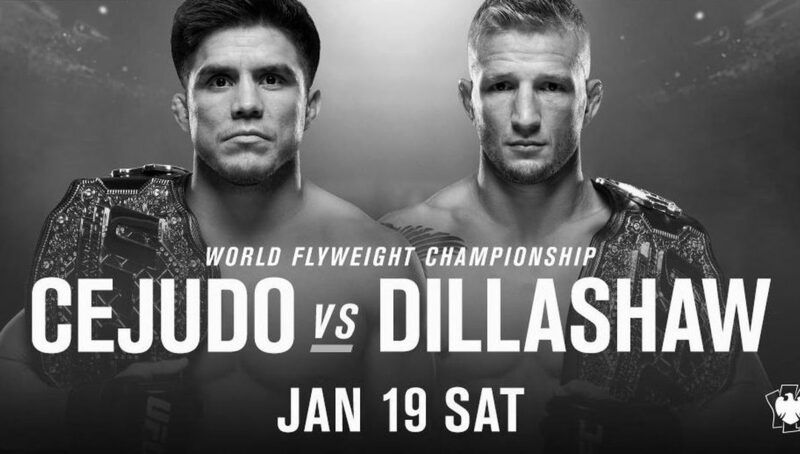 Under the tutelage of Duane Ludwig, Dillashaw’s striking has gone from mediocre to phenomenal. His footwork is masterful and he understands how to capitalize on openings with perfectly placed shots. If this stays standing, I think the bantamweight champion will put on a clinic. While Cejudo is a highly credentialed Olympic wrestler, Dillashaw is an excellent wrestler himself. I just can’t see Cejudo consistently landing takedowns and holding his foe down for long periods. If this was at bantamweight, I would be huge on Dillashaw. My main concern is how the bantamweight champion will look dropping to flyweight – he appears gaunt in social media images and I fear his chin could be diminished. Nevertheless, styles make fights and I’m going with TJ Dillashaw at -200.